The issuance of currency is a very important aspect in any cryptocurrency project. It is a fundamental part of the identity of a blockchain project and in the case of CREA it is the main active of the Creary.net social network. In this post we will focus on explaining how the new coins issuance system works in the CREA blockchain. How does the cryptocurrency issuing system work in the CREA Network? 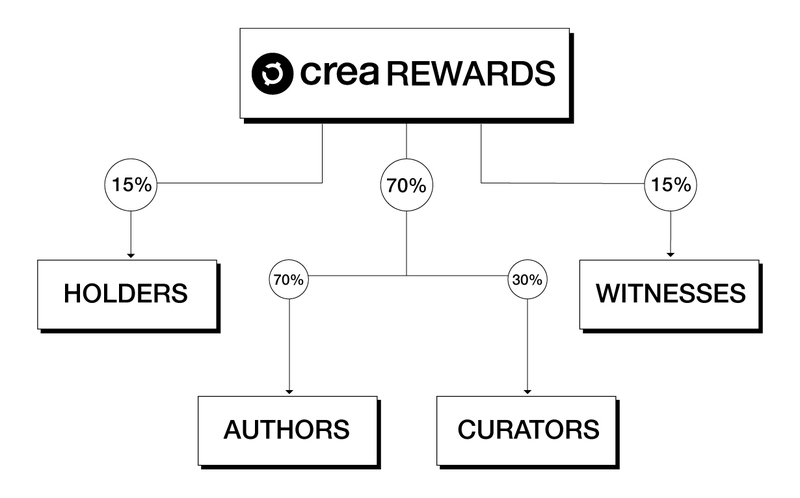 The Crea network continuously generates new digital tokens to reward content creators and curators. 70% of newly created tokens are transferred to users who add value to the Creary network by publishing, commenting and voting on other people’s posts. The remaining tokens are distributed by 15% to the owners of CREA Energy and the other 15% to the witnesses who work generating new blocks in the blockchain of Crea. In the CREA Network the issuance of new coins is based on a percentage of inflation over the total currency existing at the time. It started with an initial inflation of 7% over the total (19.2 Million CREA) and every 300000 blocks (10 days approx) is 0.01% lower, so in one year it goes from an annual inflation of 7% to 6.65%, and so on, until it reaches 1% in 20 years. This way, if we start with a virtual amount of 19.2 million CREA, 3682 CREA would be created per day. The CREA Network generates 1 block every 3 seconds. This way, 28800 blocks will be created daily. This means that, if we start with a coin issuance based on a 7% inflation, 0.127 CREA will be generated per block. current_inflation_rate: The exact inflation value that will start at 7%. BLOCKS_PER_YEAR: Fixed value of 10,512,000. A new block every 3 seconds results in 10,512,000 new blocks per year. Of the total issued, 70% will be distributed among authors and curators (splitted in 70% to artists and 30% to curators), that is, those users who contribute value to the social network by publishing quality content, evaluating and voting to projects. 15% will go to the owners of CREA Energy (CGY), always considering that it is 15% of all existing tokens at the time and that will be distributed proportionally to the total accumulated by each user at the exact moment of the distribution. Finally, there is a 15% that is distributed among a total of 25 witnesses that will vary (entering and leaving the list) according to the proportion of votes obtained by the users. The CREA blockchain presents a more sustainable and controlled coin issuance solution based on real-time inflation over the total currency issued at that time. At the same time, the reward is distributed to all the users of the network. Thanks to this distribution system, the cryptocurrency exponentially increases its degree of distribution as the CREA is distributed to a greater number of participants, converting all users of the network into “shareholders” of CREA.